Rockstar Games isn’t officially supporting mods for Grand Theft Auto V, but that’s not stopping clever players. The game is slowly being opened up, and chances are, this is only the beginning. GameSpot asked Rockstar about modding last week, and it didn’t paint a welcoming picture. Since GTA Online has such a massive and vibrant community, our primary focus is making sure that nothing detracts from that experience or has a negative impact on the overall community of players. In other words, the game wouldn’t have mod tools, and since the company sees GTA Online as critical to the game’s appeal, it would aggressively shut down mods impacting GTA Online. That all makes sense, and I’m not sure anyone expected GTA V to allow rampant online cheating. But since Rockstar wasn’t providing any guidance, it wouldn’t be clear how long fans would be waiting for mods until the game was in actually people’s hands. 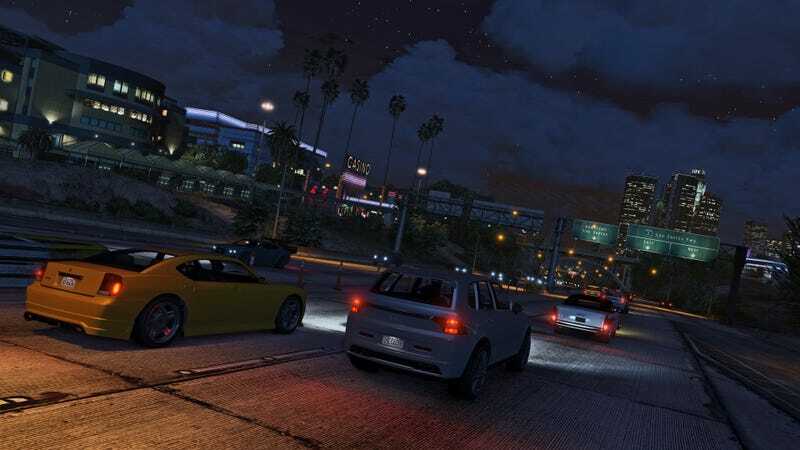 In less than day, there are already two mods available for GTA V.
One mod lets players deeply modify the game’s field of view, a graphics slider that’s come under criticism from fans for being too limited. The other mod is a trainer allowing you to, well, cheat. This trainer can grant you unlimited bullets, prevent you from ever dying, and plenty more. It’s useful for just screwing around. These are basic mods, though. What about something more ambitious? So far, it’s unclear, but there’s been a quote floating around all day by modder Boris Voronstov, best known for his work on graphical enhancement tool, ENBSeries. You might know ENBSeries because of how beautiful it’s made so many games, including Grand Theft Auto IV. That doesn’t paint a pretty picture, but there’s plenty of reason to be hopeful, as other modders appear to be making progress. What are we looking at here? In essence, OpenIV says it’s opened the door to basic mods. The tool itself has not yet been released, but OpenIV’s teasing suggests it’s not far off. It’ll take some time for things to shake out, but never count out the ingenuity of modders. There’s still the question of how Rockstar will respond to this, though. I’ve emailed the company for comment, but have yet to hear back. It’s reasonable for players to fear Rockstar might ban players who mess around with any mods, but so long as they’re confined to the world of single player, hopefully they have nothing to fear. It’s early days for GTA V’s life on personal computers, but it’s already looking pretty bright.